Parkside, being roughly half way along the Liverpool and Manchester railway line was chosen as a location for refilling the steam locomotives with water. 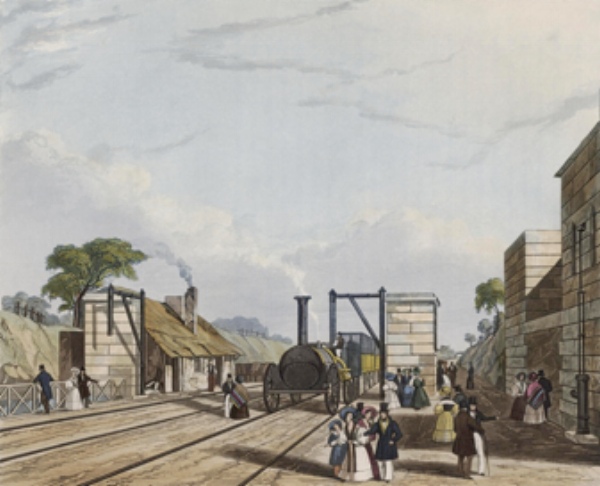 It was at Parkside during the opening ceremony of the line in 1830 that the M.P. William Huskisson was killed. He had walked down the track to speak to the Duke of Wellington who was traveling on another train when he was ran over by The Rocket. A memorial to the event was erected next to the line, which can still be seen today. Legend has it that Sir William Bradshaigh, having returned from a long campaign in the Holy Land, slayed a welsh knight on this spot. His wife, Mabel le Norreys, had thought her husband dead and had remarried. Lady Mabel, as a penance for her bigamy, walked barefoot once a week from Haigh Hall to the cross in Standishgate, Wigan, now known as Mabb’s Cross. Local custom is that if you spit on the Bloody Stone the stone turns red. It originally formed part of the kerbstone but was moved to the back edge of the pavement in 1961 during resurfacing work. Today the stone can be found in the undergrowth on the pavement on the east side of the road, on the north side of the railway line. Newton Park dates from before the Norman Conquest, and for the majority of that time was a Deer Park controlled by the Barony. A large field in the corner of the park is known as Gallows Croft, this is likely the site where baronial hangings were carried out. The oldest building on the site is the grade II listed sixteenth century timber framed barn. The listing notes that this barn is the only one of its type in the historic county of Lancashire. Most recently (1957-1993) the park was the location of Parkside Colliery, the last deep mine in the Lancashire Coalfield. Since the closure of the mine nature has reclaimed much of the land. The Liverpool Farm School, later known as Red Bank School, was originally on the other side of the road. A house and farm leased in 1858 for ten years by the Liverpool Juvenile Reformatory association. Towards the end of that lease the present site was acquired and a new school built in 1867, at a cost of £3,500, made available on loan by Liverpool Corporation. For over 150 years similar work with troubled children was carried out until the school was closed in 2014.